In 1988 three mothers sat around a kitchen table and started what is now a leading national nonprofit organization. The Pediatric Aids Foundation (based in Los Angeles) is dedicated to creating a future of hope for children and families worldwide by eradicating pediatric AIDS, providing care and treatment for people with HIV/AIDS, and accelerating the discovery of new treatments for other serious and life-threatening pediatric illnesses. The story of this organization is the story of how three mums made an extraordinary difference in the world. 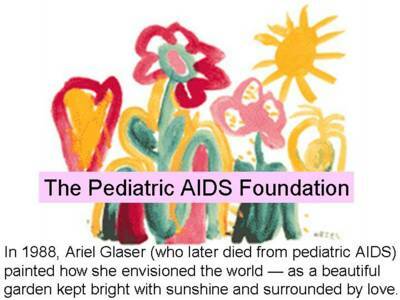 One of these mothers – Elizabeth Glaser – ultimately succumbed to AIDS, as did her young daughter Ariel. Elizabeth contracted AIDs through a blood transfusion. How would you like to make a difference in the lives of others? Can you think of organizations in the Lower Mainland doing similar work – especially with children? Offer your support to local organizations supporting the needs of sick children. Support can be in the form of time (your efforts) and/or money. Support the Variety Show of Hearts Telethon on January 30th and 31st.